Dioramas are three-dimensional crafts that convey a scene, usually illustrating the habitat of people or animals. You can create dioramas to portray different bear habitats. 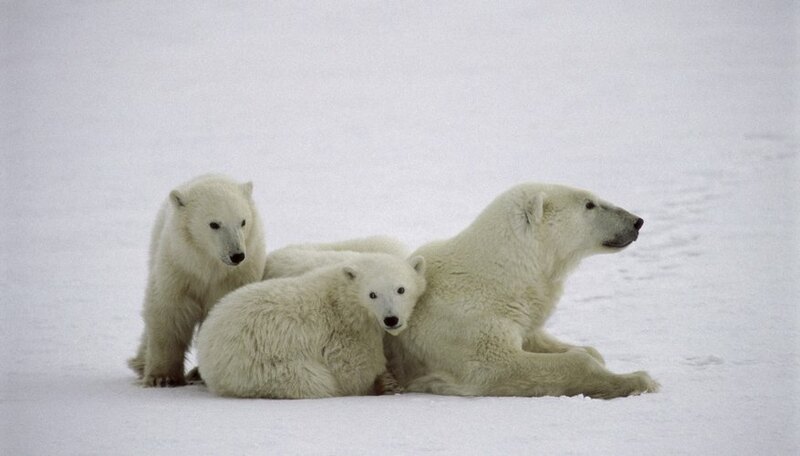 The polar bear lives in the Arctic, the brown bear lives throughout much of North America and Europe; the grizzly bear is a subspecies of the brown bear and lives in Alaska, and in the northwestern U.S. and Canada; the black bear lives in forested areas; and the Giant Panda is native to South China. For a diorama featuring the polar bear habitat, take a block of extruded polystyrene foam -- rather than a shoebox -- to represent the Arctic region where polar bears live. Use the block as the base of the Arctic habitat. Use additional extruded polystyrene foam blocks on three sides. Use a piece of white cardboard and cut out the polar bear. Lay another piece of white cardboard on the floor of the polystyrene foam to represent the Arctic Ocean. Paint the cardboard floor blue to create a body of water and paint fish and seals on the water. Consider having the polar bear "fishing" in the water to illustrate the eating habits of the bear. Decorate the box with white or silver glitter and cotton balls to illustrate the snowy region. The most abundant bear in the world, the black bear, can live in a wide variety of habitats. However, they are most common in forested areas, so the black bear diorama should represent this. Fill up the diorama or shoebox with miniature plastic pine trees or cardboard trees. Create a cave out of clay for the bear's shelter and include a blue painted body of water with fish for fishing. Black bears also eat berries and plants, so include these, as well. The brown bear is a large bear that roams through wilderness and coastal areas alike, and is one of the world's most abundant bears, and is found in North America and northern Europe. The grizzly bear is a subspecies of the brown bear, and is identified by the silvery sheen to its coat. The brown bear prefers wilderness areas that include rivers. The diorama should include a river valley, which can be created with blue construction paper on top of brown construction paper, along with a forest of cardboard trees. Since these bears dig to find roots, food and create winter dens, consider illustrating this by creating an indent in the bottom of the box and positioning the bear as if it is digging. For the panda bear habitat, cover the inside of the box with green construction paper and draw plenty of bamboo, as this represents their shelter as well as their food source. Paint mountains and forest in the background, or consider setting up miniature, fake trees around the edges of the box. Since panda bears primarily reside in China, consider including a small map of the region to the side of the diorama. The bears can be created from cardboard and set up in the bamboo or at the foot of the bamboo. The Giant Panda is listed as endangered. First Palette: Polar Habitat Diorama. Cooper, Michele. "Diorama Projects on Bear Habitats for Kids." Sciencing, https://sciencing.com/diorama-projects-bear-habitats-kids-12077256.html. 25 April 2017.